I am back. I just had tom yam for lunch. 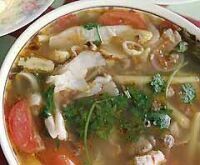 Tom Yam is a Thai-style spicy soup which is bound to increase one’s appetite (and sweat). It is hot and sour and is served hot. Great accompaniment to a steaming bowl of white rice, especially in cold weather. I do cook it once in a blue moon. Bring to boil 5 cups prawn / chicken stock. Add all the above ingredients (except prawns, squid, lime juice & coriander leaves) and simmer till baby corn and mushroom are cooked. Add prawns and squid and simmer for three minutes, or just until prawns and squid are cooked. I love tom yang very much. thanks for sharing the recipe, will try it out this week, wish me good luck!! thanks!! i tried the recipe, and it is gorgeous!!!! thanks for sharing! !